For small gherkin-type pickles, Gherking can't be beat. Pickled whole, sliced or speared, Gherking holds its exceptionally crisp texture better than other picklers we've tried. And you'll have plenty to pickle-- vigorous, disease resistant plants produce bumper crops of crisp fruits that are delicious not only for pickling, but for fresh snacking as well! To encourage production, harvest fruits regularly at 3-5 inches long. Gherking Pickler is resistant to downy and powdery mildew—two huge threats to cucumbers. Plants have a vining, upright habit and require no pollinator. 65 DAYS. FruitGreen skin, highly spined. Harvest fruits at 3-5 inches long and pick regularly to encourage production. Soil RequirementsWell-drained, sandy, loam soil. Seed CountApproximately 15 seeds per packet. CommentsGherking Pickler is resistant to downy and powdery mildew - two huge threats to cucumbers! Harvest fruits at 3-5" long and pick regularly to encourage production. No pollinator necessary. 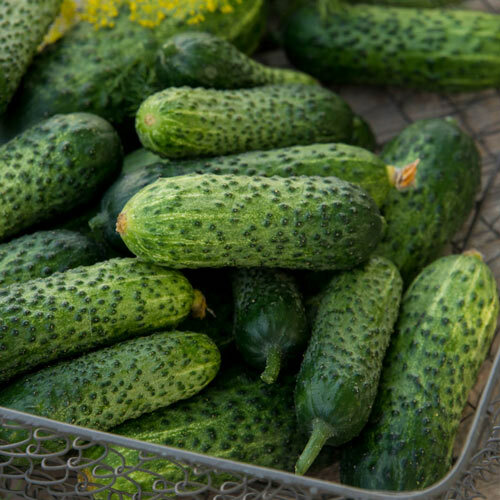 This high-yielding cucumber is delicious for fresh eating and pickling.